Spring is the busy season for the avian ecologists and interns of Point Blue Conservation Science working at the Palomarin Field Station just north of Sausilito, California. Point Blue Conservation Science has been at the forefront of protecting nature for over half a century. The Palomarin Field Station is one of the premier national locations for long-term studies on birds and their habitats and training of the next generation of conservation scientists. I was able to visit with staff members and interns of Point Blue at the station on a gorgeous April Saturday morning. The woods were filled with the singing of very active songbirds getting ready to migrate or nest. As I got my equipment ready to record the visit for the podcast, a few smiling interns walked by empty handed and then disappeared into the brush. People who works outside like this always look so happy and carefree, it made me smile. 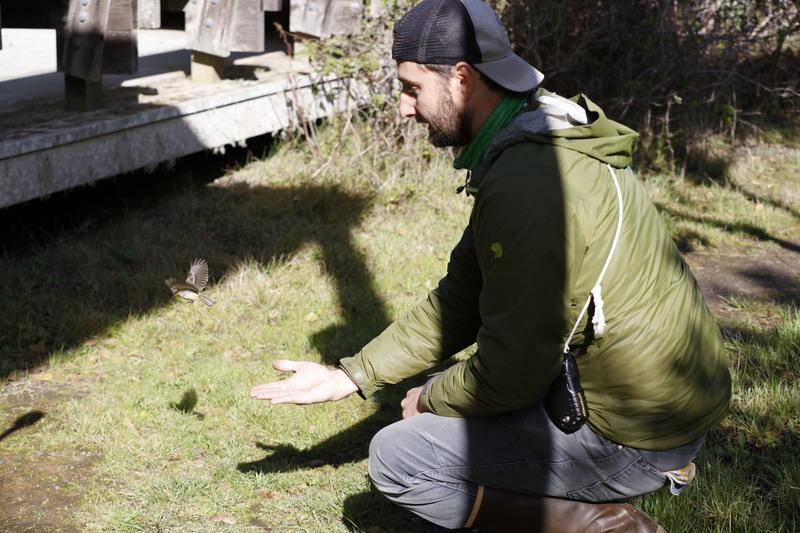 A few minutes later the interns re-appeared holding a white cotton bag they said contained a Ruby Crowned Kinglet that had flown into their mist nets, which you will hear more about in the podcast audio. Mark Dettling, the Point Blue avian ecologist was handed the bag and he clipped the bag onto a strap across his chest and began to warm up his hands for handling the bird for the bird banding process. Lishka Arata, the Outreach and Education Coordinator for Point Blue was also present and assisted Mark in explaining the procedure. The interview started with the bird banding but instead of beginning the audio there, I decided to put the bird banding explanation toward the end of this episode and lead with Mark and Lishka’s introductions. After the introductions, Mark and Lishka took me outside to walk to the net locations so I could get a better understanding of what the process and their research. We began at the closest mist nets and then walked the property around the station to several other mist net locations. My goal with the field trip was to take you, the listener, through the process in hopes you get the desire to visit the field station or a similar station near you to learn more about birds and how this research can give insight into the health of environment, how it is changing and how the birds, animals and plants are adapting. During this show you will hear ambient sounds such as some Townsend Warblers and other birds we encountered. You will also hear us slushing through mud puddles, breathing a little hard as we walked uphill and wind in the microphone. I hope you can get a feel for the walk, maybe close your eyes and listen and concentrate on the sounds of the outdoors. Enjoy the show and the photos of our trip in the show notes. More pictures of the bird banding and mist nets can be found at www.beprovided.com.